Volkwagen’s venerable GTI has long been a Consumer Guide® Best Buy, and a recent test served as an enjoyable reminder of why. Rather thick rear roof pillars that block some of the view to the back corners account for one of the GTI’s very few flaws. A neat feature (two, actually) is that the round VW badge not only pivots to open the hatch lid, but it flips up to reveal the rearview camera, which keeps the lens clear of muck in bad weather. 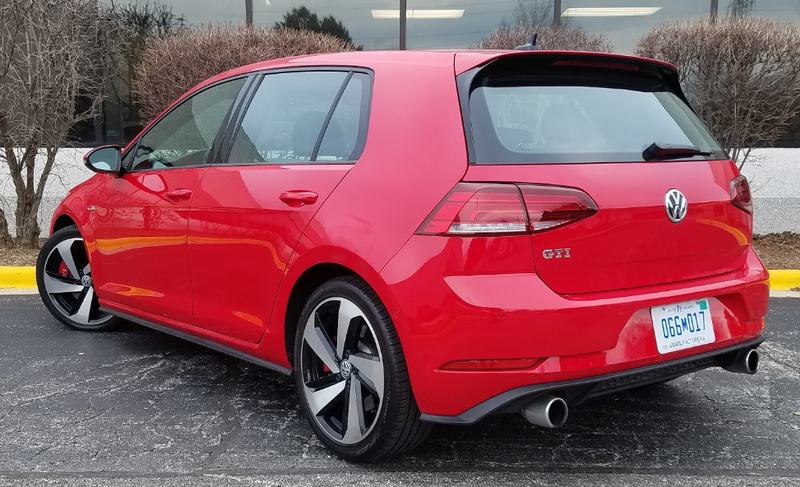 Despite not being the fastest of its kind, the GTI holds a spot on the unofficial Auto Enthusiasts List of Qualifying Cars that is primarily filled with nameplates costing far more. Part of that is heritage, perhaps, as the GTI was the original “hot hatchback.” But it’s also because … this is just a really good car. 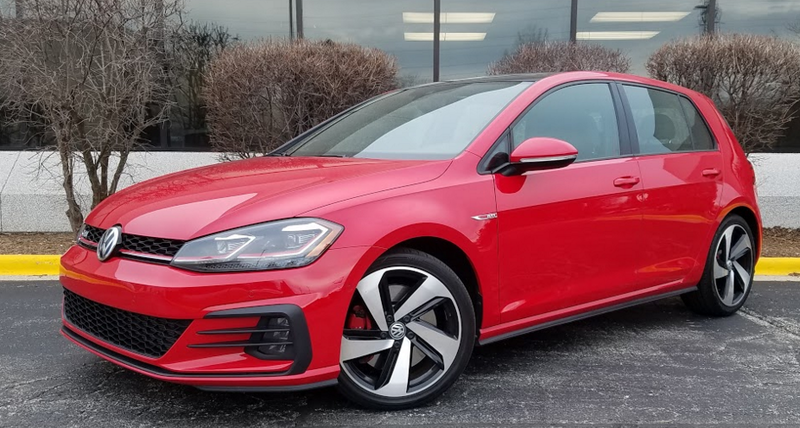 In a segment where some classmates have been called “Boy Racers,” the GTI could be called, “The Gentleman’s Racer.” Although performance has always been the GTI’s raison d etre, it is far from the car’s only outstanding quality. 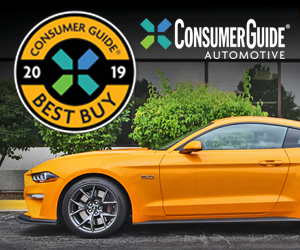 Step inside, and you’re greeted with comfy seats, fine materials, easy-to-decipher controls, and a classically simple dashboard layout, all adding an air of sophistication to a segment that generally leans toward splashy exuberance. Fire up the 220-horsepower turbocharged 2.0-liter four, and it sounds … eager. Press in the light clutch, “palm” the GTI’s signature golfball-textured shift knob (manual transmission only), and snick the lever into first gear. The clutch releases with smooth precision, and every gear change is a delight; manual shifters really don’t get any better than this. A stab of the throttle results in impressive response, with just enough turbo surge as revs build to make it feel invigorating. Visual elements that make a GTI a GTI. Of particular note are the “striped” headlight lenses and the golfball-textured shift knob, the latter dating back to the ’83 original. Volkswagen has always done a great job of combining sporty handling with good suspension compliance, and the GTI might well be the best of the company’s efforts. Steering is quick with good “feel,” and there’s little body lean in fast corners, the two combining for a very sporty driving experience. Yet bumps are masked quite well, making this a much more livable combination than many competitors where roads aren’t routinely smooth. For a compact car, the GTI offers a huge amount of headroom and legroom up front. Although the 2-door version — discontinued last year — offered a larger door opening for bigger folks, the 4-door’s portals are hardly confining. Room in back is sufficient for six footers unless the seat ahead is pushed far rearward. Visibility is good to the front corners, fair to the sides, but rather restricted by thick roof pillars to the rear corners. A rearview camera is standard, but it only displays about a 160-degree view, so it’s tough to see cars coming down a parking-lot aisle. A model of clean design and practical layout, the GTI’s interior is dressed with fine materials, numerous padded surfaces, and sporty trim befitting the car’s focus. 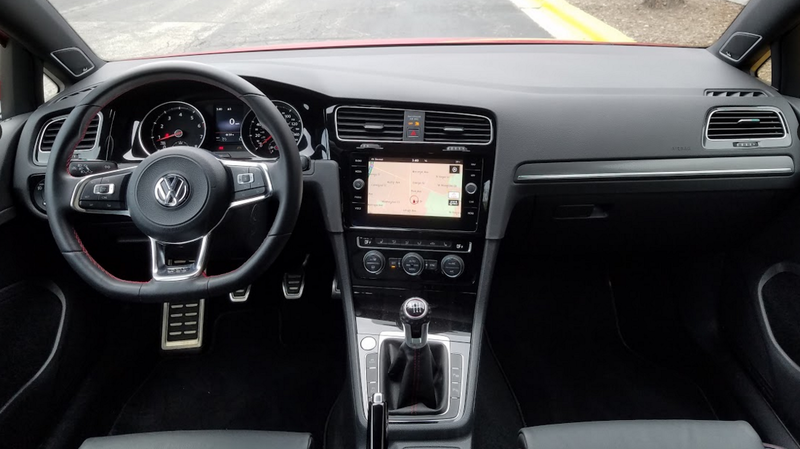 Volkswagens have some of the easiest-to-use infotainment systems out there, with simple knobs and buttons being assisted by large, “virtual”screen buttons in a layout that’s easy to decipher. 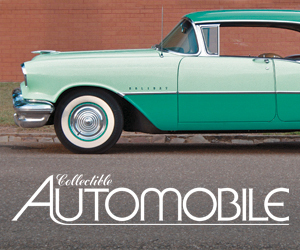 Our test car had a CD player — an increasingly rare feature — but it was hidden away in the glovebox. Climate controls are also easy to use, and include separate buttons for mode that allow you to select windshield, dash vent, and floor vents all at the same time, an unusual feature. 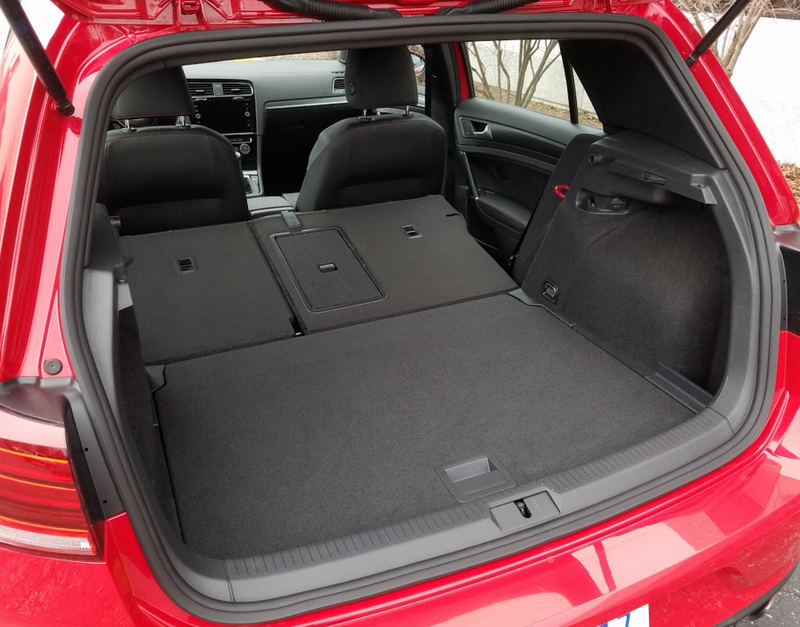 Fold down the rear seat backs, and the GTI’s flat-floor cargo area offers nearly the volume and cubic practicality of a small SUV’s. Another real strength of the GTI is its cargo versatility. The interior features a number of handy storage spaces, highlighted by a left-side dash bin and a covered forward console bin that hosts Aux and USB plugs. In back, the squared-off rear roofline maximizes the effectiveness of the hatchback body design. Unlike many hatchbacks, the hatch itself has an “underhand” grip handle, which is easier to release while closing. The cargo area is wide at the rear, and the floor can be set at two levels; the higher sets it on the same plane as the folded rear seat backs, while the lower one allows for taller cargo. Our top-line Autobahn trim level came with a host of features, and there are no factory options aside from an $1100 6-speed automatic transmission. (There are, however, several dealer-installed accessories.) Standard are such items as dual-zone automatic climate control, automatic high beams, leather upholstery, heated front seats and washer nozzles, rain-sensing wipers, 12-way power driver seat with lumbar adjustment, keyless access and starting, navigation system, sunroof, and an 8-inch touchscreen. Also standard are high-tech safety features such as forward collision warning and mitigation with pedestrian detection, lane-departure warning, blind-spot alert, and rear-cross-traffic alert. If its near-$36,000 sticker seems a little stiff for your budget, note that the base S starts at a more palatable $27,265. It’s not exactly cheap, but the GTI makes its mark as a practical car with enough sporting flair and pedigree to give it an approving nod from those who spent a lot more for their less-practical sporty cars. Written by: The Daily Drive staff on April 6, 2018.on April 9, 2018.